Despite dipping modestly from intraday all time highs on Tuesday, the S&P500 has largely ignored the recent turmoil involving the pleas by Michael Cohen and Tim Manafort, and the increased peril that Trump has found himself in. As Deutsche Bank's Jim Reid put it, "the interesting thing about markets over the last 24 hours is that, despite all the furore surrounding the legal dramas in Washington - with markets and news outlets across the board now speculating about how close this gets to the Presidency - markets and especially risk assets have shrugged their collective shoulders for now." Plenty of discussion but no conviction yet as to what this means. Indeed it’s not clear whether further legal problems for the administration would distract from or increase focus on fighting a trade war." 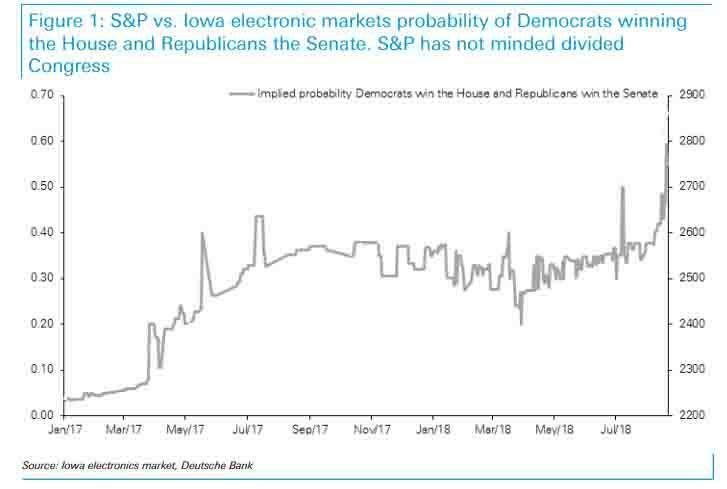 Yet the recent political drama has certainly not gone completely unnoticed, and a look at the latest Iowa Electronic Markets online marketplace - one of the preferred electronic venues to track market odds of the outcome of the 2018 Midterm elections - shows that as of this moment, there is a more than 50% probability that Democrats will win the House, even as Republicans retain control of the Senate. The chart below is the "US Congressional Control Market" contract, and specifically bets that Democrats win the House, and Republican win the Senate. It shows that for the first time, the contract has crossed above 50%, a move which was catalyzed over the past 3 days following the latest newsflow out of Washington. On the surface, the fact that the market believes the GOP will keep the Senate should be welcome to Trump, as it means that even with a Democrat flood in the House, there will not be enough votes in the Senate to impeach the president. It is also worth noting that there is absolutely no correlation between the S&P, and the odds Republicans lose control of the House. US political events will impact the USD" and other assets. According to Ruskin, "the short answer is “negatively” on a short and medium-term basis. The longer answer requires a deeper dive into the multiple channels through which US politics will impact the USD." Trade. It would seem likely that a distracted President is more likely to try make deals. In contrast countries on the other side are more likely to try sit out a Presidency and wait for US political change. Either way, the US negotiating hand/position is weakened. Less protectionist policy would be widely seen as risk positive, which at least partly explains the equity market resilience today. More vol. There will be more political pressure to make positive headlinegrabbing news; there may also be more headlines/news that distract. This should encourage more volatility, but it is prone to be difficult to trade ‘headline risk’. The market has marked up implied vols for the mid-term elections modestly - EUR/ USD and USD/JPY vols on the day are 15 and 20, respectively. They will probably go up more. 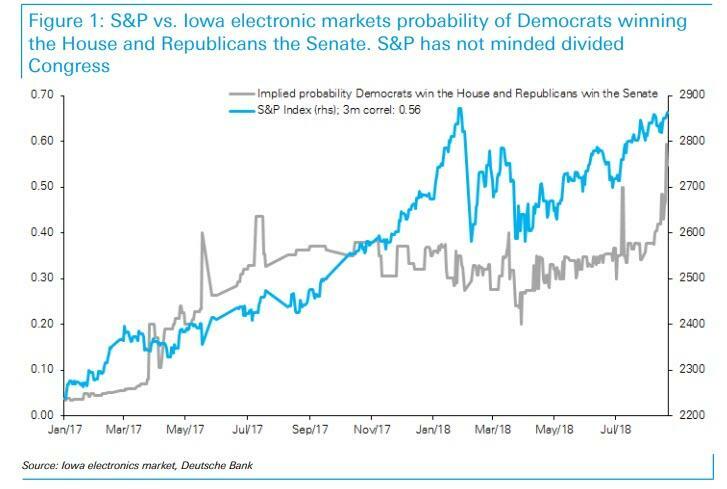 Note the Iowa Electronics mkt has a 55% probability of Democrats controlling the House and Republicans the Senate, and a 11% probability of the Democrats controlling both the House and the Senate after the mid-terms. 538 currently has a 73% probability for the Democrats controlling the House. There is a lot of potential movement here. Fiscal policy. The President’s fiscal initiatives are largely done. However, CBO projections show ballooning deficits far into future. Less political support/‘belief’ in long-term structural growth will force a quicker retreat to fiscal expansion, albeit likely more a story for 2021. The risk is that the USD ‘arc’ is even more pronounced, with current USD positive, easy fiscal, tighter monetary policy mix, giving way to tighter fiscal, easy monetary policy in 2021, that would be very USD negative in the longer-term. Risks are that this negative USD long-term view is partially discounted as USD negative even in the shorter-term. Monetary policy. In the short-term this could end up as adding to, or, reducing the Administration's jawboning of US short-term rates down, and, the USD down. However, this has not been very effective so far, and there is even less chance of the market responding to such talk on a sustained basis if the President is perceived as weakened, in our view. There are also questions about how this could impact Fed appointments in the future, perhaps skewing candidates to the dovish spectrum? Perhaps, but the market will likely become more worried about this, if the chances of the President serving two terms is on the rise. In theory any changes in jawboning would be less USD negative, but in practice this is likely to prove largely inconsequential. Taking the key arguments above as they relate to trade, risk (risk is protected by the trade issue), and the long-term fiscal/money policy mix, to Ruskin "the impact of latest political developments are skewed modestly to the USD negative side." Then again, one look at the dollar index shows it spiking - most likely on thin liquidity and positioning - so take all of the above with a grain of salt.